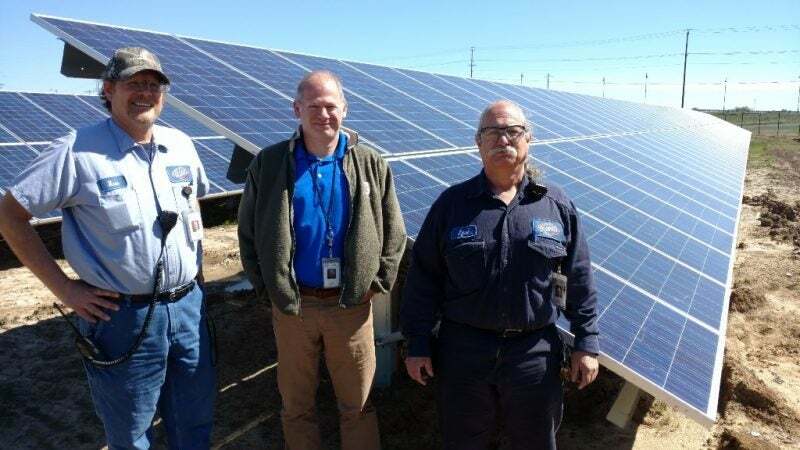 Russ Cuba, Eric Snyder, and Jose Martinez of Clorox stand beside new solar panels at the plant in Fairfield, California. In March, our Fairfield Cleaning plant activated solar panels, becoming the second Clorox facility to do so. The ground-mounted system produces 500 kilo-watts of power during daylight hours. That helps offset a large portion of electricity previously purchased from the grid — along with the associated greenhouse gases. This is the only Clorox-owned facility to install solar. The first installation was a roof-mounted system at our leased Regional Distribution Center in Aberdeen, Maryland. Both solar panel arrays were built with a third-party provider as Power Purchase Agreements. That means we didn’t spend company money to build these projects, and the facilities buy the solar-produced power from the third party instead of from the utility. We installed the Fairfield solar array at the corner of the plant property, along a main artery between the California cities of Fairfield and Vacaville. It’s visible to as many as 25,000 cars that pass by each day. It’s also adjacent to railroad tracks and visible to the 90 commuter trains that run every weekday between the Bay Area and Sacramento. The Fairfield Plant is also only one of two Clorox sites to have earned zero-waste-to-landfill designation. Environmental sustainability is very important for the Fairfield Plant and the Clorox Company as a whole. Plant employees are proud to show others within the company and community how zero-waste-to-landfill can be done.